Joey Carbery faces a fitness race to feature in Munster's season-defining Champions Cup quarter-final with Edinburgh. 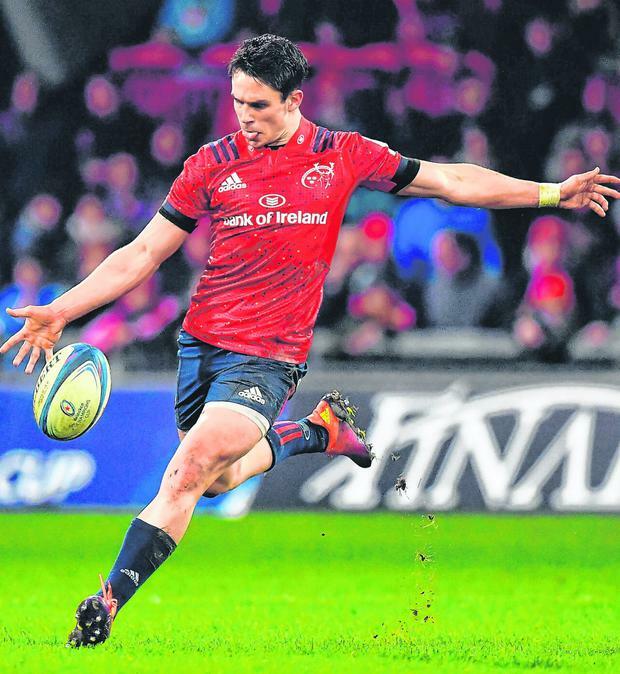 A hamstring injury meant Carbery missed Ireland's last three Six Nations games and, after he linked up with Munster again yesterday, coach Johann van Graan ruled him out of Saturday's PRO14 clash with Zebre at Thomond Park. The 24-year-old out-half is not expected to complete any on-field training this week as he works with the Munster medical team, but Van Graan is holding on to hopes that he will be ready to feature in Murrayfield on Saturday week. "I don't want to speculate. I hope that he'll be back for next week's game. It's a bit early to say whether I expect him to be back, I really hope he's back," said Van Graan. "He's going to be with our medical team this week and hopefully we can get him into some rugby this week or next week. (He's not ready to train on the pitch) at this stage. All things going equal, he's in a very good mental space and hopefully he'll be back on the pitch soon. "He is a very important player in our wheel at this stage. His goal-kicking and the energy that he brings, he is a player that made a big difference to our team so we really hope he is going to be ready for Edinburgh." Defeat to Scarlets in their final game before the two-week break meant Munster slipped behind Glasgow in the battle for top spot in Conference A, but their hopes of a win against Zebre have been boosted by the return of some of Joe Schmidt's Ireland squad. It is expected that as many as five of the internationals - including Tadhg Beirne - could feature at some stage this weekend, while Chris Farrell, who wasn't involved in the last three Ireland games, has also returned to the fold. "We'll take it case by case. Joey and Chris Farrell are in today. Obviously they weren't involved over the weekend. Tomorrow there'll be four or five guys joining back up. Next Monday the rest of the guys will be back. "There is a good chance that Chris (Farrell) will play (this weekend). He hasn't played now for a few weeks, he played quite a lot of games when he came back to us against the Kings. All things been equal there is a possibility he'll be in the 23. "Possibly Tadhg (will feature). He'll only be in tomorrow because he played on Saturday night. They only returned from Wales yesterday. We'll have a chat to him and look where his body is at, and where his mind is at." John Ryan and Andrew Conway didn't feature in the Ireland loss to Wales, while CJ Stander played three of the five games and could appear this weekend, but the Munster coach will assess each player on their own merits before handing them a return to action.